A shop vac is needed for every operation of dust-generating power tools (see list below). It is also useful for cleaning your workspace or the floor after you are done for the day. Floor attachments should help clean the rooms more effectively. We have a few that came with the small "Shop Vac" brand machine; Mitja also 3D printed an orange adapter to connect those with the Festool hose. On a windless day you can empty the shop vac's dry bag into a regular trash bag outside. If you notice any damage to the bag, or dirt inside the machine, report it immediately and do not use the machine until a new bag is purchased. 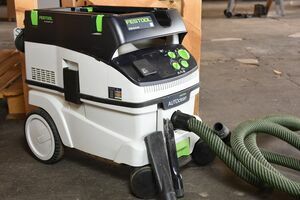 The large Festool shop vac can also be used as an extension cord of sorts and supports continuous (manual) or automatic (depending on the connected tool) action. Use this shop vac whenever dealing with dangerous dust - it is class "M" rated. Our small shop vac is not equipped with a fine filter and therefore unsuitable for harmful dust. It is quite okay for "normal" cleaning tasks, though, and might be enough to hook up to the CNC router's dust extraction. Perhaps we should add a fine dust filter to its exhaust once everything else (cyclone separator, connecting hose to the CNC router) is set up, we'll see! This page was last edited on 2 March 2019, at 09:15.